Robert, was born in County Monaghan, Ireland, in 1833, and by 1852, he had immigrated to Ontario where he secured work on the construction of the Railway. Fifteen years later, in 1867, Robert returned to Ireland and married Rebecca Dawson of the Monaghan County. They farmed in the Mardale, Ontario area for the next ten years. In October 1877, Robert, Rebecca and children, Eliza, Mark, Jane, George and Axel travelled by boat from Owen Sound, south to Duluth, Minnesota, then by rail to Fischer's Landing, and again by boat up the Red River to Winnipeg. On arrival, Robert purchased an ox and a Red River Cart, some provisions and set out for their destination, Palestine later known as the Gladstone area. Life was lonely, but missionaries arranged services in homes. Robert had a real Irish Wit, and on occasion the Methodist Minister asked him if he was "saved". He replied, "of course I'm saved or I would not be here now". Because of floods from the White Mud River during the next two years, Robert and Rebecca decided to move to higher land in the Riding Mountain country. 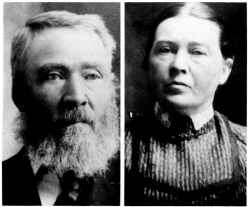 In the summer of 1879, the family made the trip of fifty miles on foot. They drove their three .cows, three calves, a pig and a yoke of oxen. The oxen were later sold to Pat Burns. They homesteaded S.E. 23-16-17W in the then Rural Municipality of Clanwilliam in the Empire district. Another eight children were born on the farm. They were; Sam, Willie, Tom, Jim, Frank, Annie, Albert and Harry. Robert and Rebecca farmed and were active in the community. Robert passed away in June, 1921, and Rebecca remained on S.E. 23-16-17W for 69 years, passing away in 1948. 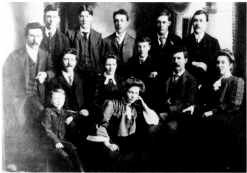 The Robert Madill Family - 1903. Back Row, Left to Right: Frank, Jim, Tom, Willie, Sam. Centre: George, Alex, Jane, Albert, Mark, Eliza. Front: Harry and Annie. Albert, twelfth child of Robert and Rebecca Madill was born July 4, 1893, on the homestead S.E. 23-16-17W in the then, Rural Municipality of Clanwilliam. He at­ tended New Holland school and then worked in the area. On November 23, 1916, Albert married Jessie Angus. They farmed in the Clan william district and later in the Bethany district and during this time, he did carpenter work in the Minnedosa and Clanwilliam area. In 1918, a son Angus was born. In 1929, they gave up farming and moved to the Wasagaming townsite at Clear Lake where Albert became a well known building contractor, and later, son Angus joined him and formed a partnership. Albert and Jessie spent their winters in California. In 1967, Albert retired and he and Jessie moved to an Osborne Housing Unit at Neepawa. In April, 1977, Albert passed away. Jessie now resides at East View Lodge, Neepawa in her 87th year in 1983. Their son Angus, (refer to Madill, Angus and Irene). Angus, son of Albert and Jessie Madill was born April 3, 1918, at Eden, Manitoba, and attended school at Crocus Hill and Bethany. Angus and his father Albert were Building Contractors in partnership for thirty years in the Clear Lake, Erickson area until Albert retired in 1968. Angus then continued on his own.